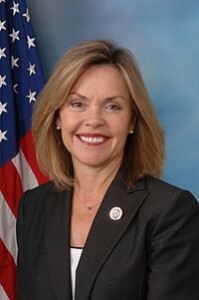 Democrat former Rep. Betsey Markey is one of our favorite Democrats because she’s so gaffe prone. That’s why we were so excited to see that Markey would lead the state’s economic development and trade office under Jared Polis. Markey shouldn’t feel too bad. We bet Treasurer-elect Dave Young can’t identify it either. Of course, Markey’s appointment to this position, in charge of bringing new businesses to the state is massively ironic as Markey actually has little private sector experience. According to her CV, Markey entered politics right out of college working on the staff of U.S. Senator John A. Durkin (D-NH). She later worked for a Congressional subcommittee. Markey, then, spent most of the 1980s hopping between government jobs at the U.S. Treasury and State Department. Later in life, Markey worked on the staff of for former Sen. Ken Salazar before announcing her run for Congress. She won in 2008 and spent the next two years back in D.C. After her defeat in 2010, Markey got what many believed was payoff for her vote in favor of Obamacare when she was appointed Assistant Secretary for Intergovernmental Affairs in the United States Department of Homeland Security. She resigned that post to run for Treasurer. Somehow in there, she co-founded Syscom Systems, which appears to be her only private sector experience. Then, again, in Colorado, we’re pretty used to wholly unqualified Democrats getting plush appointments.